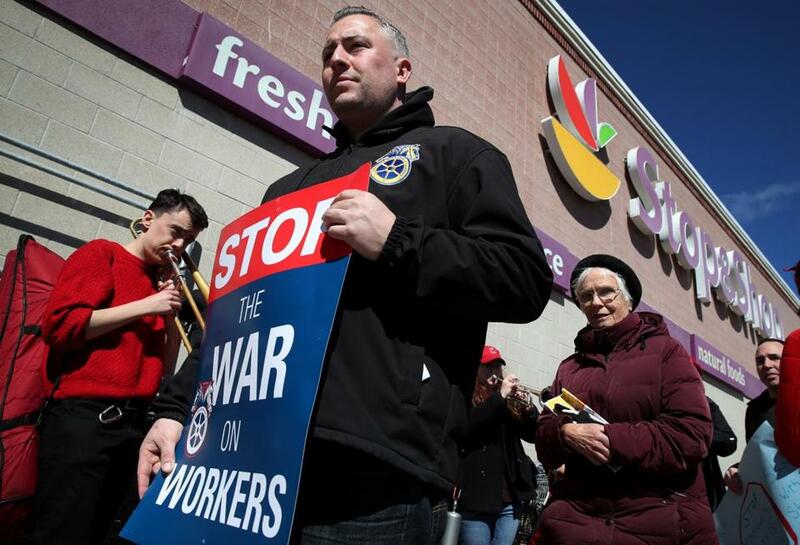 Teamster Payton Corbett (Teamster Local 122) joined members of the United Food and Commercial Workers Union (local 1445) and their supporters during a “Customers Care” rally at Stop & Shop in Somerville on March 23. Talks between Stop & Shop and unions representing thousands of striking workers will resume Monday after the two sides spent the weekend in negotiations, a union spokeswoman said Sunday night. On Thursday, 31,000 members of unions with the United Food & Commercial Workers went on strike at 240 Stop & Shop stores in Massachusetts, Connecticut, and Rhode Island. Five UFCW unions represent the striking workers at those stores. The strike was called after negotiations hit an impasse over pension and health benefits. Negotiators for the unions and the company were back at the table Sunday morning after conducting negotiations all day Saturday, said representatives for the two sides in separate statements to the Globe. The talks are being conducted with the support of federal mediators, according to Jennifer Brogan, a spokeswoman for Stop & Shop. Stop & Shop has said it had a contingency plan in place for stores where workers are striking. Stop & Shop, part of the same parent company that owns Hannaford and Food Lion, has more than 400 stores and 60,000 workers. A UFCW spokeswoman said in a statement Sunday morning that all five unions involved in the strike are committed to reaching an agreement. On Saturday, Stop & Shop president Mark McGowan said he and the “entire Stop & Shop team remain firmly committed to getting a fair contract in place for all of our associates in New England,” according to a statement released by the company. In the statement, McGowan said the company’s offer includes pay increases for all associates, health coverage with deductibles that would not change, increased contributions to employee pension plans, and no changes in paid time off or holidays for current associates.